Depression and bipolar disorder affect millions of people, but the treatments we have today don't work for everyone. First, we bring together people with mood disorders, clinicians, and researchers. Second, we gather a lot of data about depression and bipolar disorder. With this much information, our study can lead to greater understanding and better treatments. Why should I join MoodNetwork? As a member, you can share your thoughts and experiences in forums and blogs. You can take surveys and use special tools to track your mood, and follow your progress on your own personalized and customizable page. Your information can help researchers understand mood disorders and come up with better treatments. You can join research studies available only to MoodNetwork members. Who knows the most about depression and bipolar disorder? When you join MoodNetwork, you'll be able to tell us about your experience of living with a mood disorder. With enough information, we can understand more about mood disorders and how best to treat them. 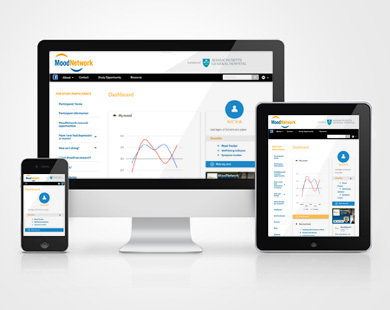 When you join MoodNetwork, you’ll collaborate with doctors and researchers in a nationwide study to fight mood disorders. For perhaps the first time, your experiences, your concerns, and your ideas will take center stage. Instead of a one-size-fits-all approach to treating depression and bipolar disorder, MoodNetwork's goal is to figure out which treatment, therapy, and practice works best for which person. We're not kidding ourselves. It’s going to take a while to find better treatments for depression and bipolar disorder. But we’re not giving up. If we join forces, we will reach our goal.